OK so I'm a bit of a design geek and Staci is too when it comes to the house...having this kid is bringing it out a bit more. So as we start to fill the baby bedroom we're using it as an excuse to get some cool looking things. 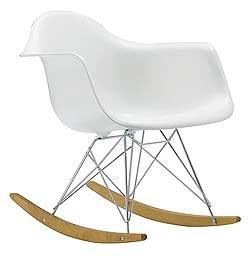 As you may have read I'm a fan of Eames stuff so one of our must haves is the Eames Molded Rocker aka rocking armchair rod (RAR). It's a really nice low rocking chair. And I need to stress low because some folks don't realize it's height. But really you wouldn't want it higher because it's a rocker. Any way the chair has beautiful form. While the original was made with a molded fiberglass seat they are now made of plastic...not sure why that is...maybe fiberglass is bad for you or the environment. The base is chrome that lead to maple legs. 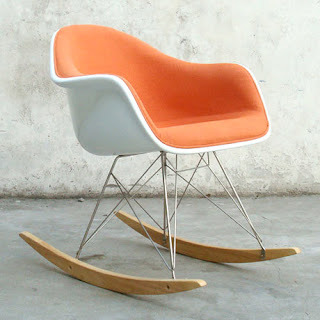 Like the Eames molded plywood chair this one is super comfy. But here's the deal. This is going in our baby room and that baby will grow and become a kid who will draw on, paint on and if it's like me pretty much destroy furniture. So Staci and I weren't comfortable with throwing down $500 on the Herman Miller version from Design Within Reach. As much as I love and respect well designed furniture like this we started looking at knock offs since it will be in a kid's room. We found 2 knock offs, I'm sure there are many more. Both are a tiny bit smaller than the original but we're talking an inch at most. The first was from Advanced Interior Designs. They have some really great looking stuff but it's in California so I haven't been able to check out quality. The price there was lower at $299. Then we happened upon one on Sears.com, yeah Sears. The price was much lower...about $130. So thinking that this will be living in their room, and maybe destoyed at some point, we decided to go for this one. The quality is not the same as DWR...we didn't think it would be. But the chair seems sturdy. Maybe if you're a bigger person the plastic would be too thin but it is great for us. Plus it leaves us with cash to splurge on the nicer furniture for the rest of the house. So now you know you have options...you can get some good design at whatever price you desire. Oh...and for you UK folks I found this awesome version that is padded...I might need to have this one shipped across the pond...super cool. And if you ever want to review one of my baby items for little one in January let me know! That orange/white combo is awesome! Reminds me of those egg chairs that hang from the ceiling. C- yeah that one rocks...I think it would cost a bit to get it over here...but I'm gonna try to hunt one down. Jennette- shot me an email to the address that's in the header of my blog. my professor has the robins egg blue one, and a miniature model of one of the office chairs that they created and Herman Miller makes!